Active cancellation over a deep, broad range of low frequency noise. Weighing in at 13 ounces, extended wear is a pleasure. 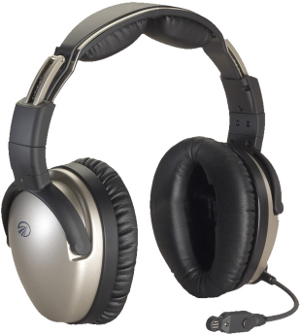 A thin, low-profile, stainless steel headband helps with cabin clearance and adds durability. Designed for comfort with plush ear seals, the magnesium ear cups extended range performance profile is superior at blocking out high frequency noise. Full stereo music streaming (A2DP) compatibility allows wireless connection from Bluetooth phones or other devices. An integrated control box input allows you to connect a cell phone, music player or iPod for a range of communication options. A Lightspeed exclusive technology automatically adds a dynamic surround-sound like quality to music. Receiving radio communications is a snap with MusicMute which automatically decreases a music player by 80 percent, lessening the chance of missing important interactions. Match audio panel inputs with a quick switch to stereo or mono. Battery and panel power models, straight or coil upper cords. Dual GA, Single LEMO or Single U-174 connectors. Low impedance microphone options are available. Carrying case, cell/music patch cords, 2 AA batteries, and foam wind screen.